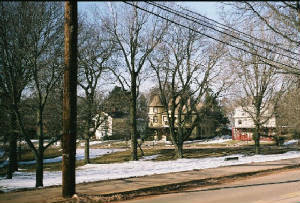 North of the downtown, Talcott Park is a small urban park surrounded by homes of the Victorian era. The Talcott family were early mill owners in Rockville. Phineas Talcott built this Greek Revival style house in 1846. It faces Talcott Park, formerly a pasture on the Talcott farm. President of the American Mill in Rockville, Talcott was also a Judge of Probate, with his office in the house. At 14, George Sykes was a carding boy in a woolen mill. By 24, he was in charge of a Vermont mill. He moved to Rockville in 1866. By 1903, he was president of the Hockanum, New England, and Springville Mills. Under his leadership, Rockville gained a reputation for quality woolen goods.